The end of 2011 is right around the corner. If I were to reflect on the central theme of this year was like to me, one word resonates loudly: change. Our journey required drastic adjustments to how we lived, how we budgeted, how we managed time, and how we looked for resources. We were in a position where we had no other choice but to make changes. This is why the book 'Jolt!" by Phil Cooke spoke directly to me. It gave me the pep talk that I needed when my desire to fully embrace change was losing steam. I felt encouraged to dream again -- nothing was off-limits. I was ready to take in whatever God wanted for me and my husband as we took on new roles. The book also pushed me to make a more realistic approach in determining goals that are attainable. I took a hard, reflective look at my God-given gifts, and how I can passionately put them into action. One of my biggest things in finishing a book is the way each thought is compartmentalized. 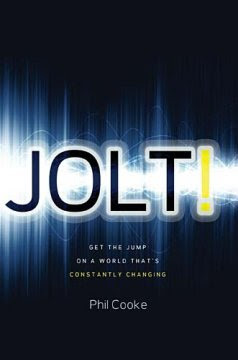 "Jolt!" does a very excellent job in dividing it into five critical sections with helpful review questions at the end. The sections are: Jolt Your Direction, Jolt What Matters, Jolt Your Potential, Jolt Your Heart, and Jolt Your Future. Because of how it was topically arranged, I was able to fully engage in each of the 25 chapters without feeling overwhelmed with information. If you are currently embracing a major life change or even considering one, this book is an outstanding step-by-step guide into helping you make wise decisions as you take on a new journey. Change is good for you and me. Let's use this resource as we take our next courageous steps! Disclosure of Material Connection: I received this book free from Thomas Nelson as part of their Blogger Review Program called Booksneeze. I was not required to write a positive review. The opinions I have expressed are my own. I am disclosing this in accordance with the Federal Trade Commision's 16 CFR, Part 255: "Guides Concerning the Use of Endorsements and Testimonials in Advertising."